Papa to five grandchildren, Dad to two daughters and two sons-in-law, Husband of one wife. Leaving a legacy of thought and perspective worth carrying through the generations that follow. As we rush to push God, Christ, and references to the Ten Commandments and nativity scenes out of our public visibility, schools, and politically correct conversation, when tragedy strikes we are quick to offer our thoughts and prayers for the people impacted by tragic events. A question might be asked about to whom the prayers are being offered and what exactly we’re thinking about. It all seems to beg the question about the value of thoughts and prayers. First let’s talk about offering our thoughts. I can sit on the Ponderosa and think about a lot of things and perhaps some might argue that that karma is oozing out of the windows as I post pictures and thoughts on social media. The net result is negligible because other than having the other person “feeling good” that their friends are thinking about them, there is no outside power or support brought about through our thinking about a situation. One might argue that thinking of your loss or pain might give me additional empathy for you, but I’m not aware of any healings or changes of circumstance that have been brought about through the thoughts of friends and neighbors. Because of this, my friends will need to excuse me for not offering my thoughts. I have found them to be ineffectual. The book of James chapter 5 tells us a couple of things in verse 16, “Therefore confess your sins to one another and pray for one another, so that you may be healed. The prayer of a righteous person is powerful and effective.” Many would like to lean on this passage for the power of prayer, but we have to remember that this is prayer by one and for another person who have submitted themselves to a truth system and faith proposition that believes in God, the Father, and the redeeming work of Jesus Christ. So this is not a one-size fits all kind of prayer. In Matthew 21, Christ talks about His Father’s house being a house of prayer. How many have darkened the door of a house of God honoring prayer recently? Later in verses 18 – 22, Christ again talks about what is required for effectual prayer. In the closing sentence of that section He tells His disciples, “And, whatever you ask in prayer, you will receive, if you have faith.” He talks here about moving mountains. I’m here to tell you that this really works and that I’ve seen mountains moved just in the past few months. God has responded to some BHAG requests (Big Hairy Audacious Goal to borrow a term from Jim Collins’ “Good to Great”) in ways that leave little doubt as to the effectiveness of prayer! God has moved mountains! There has been a lot of bad news of late in our world. So bad, in fact, that the New York Daily News published a headline boldly stating that “GOD ISN’T FIXING THIS.” The front page went on to pronounce the futility of “thoughts and prayers.” This is the world’s view. In scripture we see that Christ regularly retreated to a solitary place to pray. If prayer was of no effect, why would Christ go away to pray? Why would He tell us to pray without ceasing? Why would He say that He hears our prayers from afar? If we look again at the James 5 and Matthew 21 passages, both (and many others) talk of prayers being offered by men and women of faith and in faith. By “in faith” I mean that we who have placed our faith in the Father, Son and Holy Spirit, and know that “without faith it is impossible to please him, for whoever would draw near to God, must believe that he exists and that he rewards those who seek him.” (Heb 11:6) We’re talking about prayer and relationship here, folks. We can’t deny God’s existence or relevance and expect him to respond to our foxhole cries for help. When Noah built the ark, he was scorned until the day it started raining. Only 8 people from all of earth’s population were spared by getting into the ark. God promised that He would never do that again and from that promise, we have rainbows that color our skies. There was a time when the prophet Elijah despaired of life itself, sensing that he alone was left to serve and honor God among all the people of Israel. God took him to a quiet place and when Elijah had calmed down, God assured him in a quiet whisper that He had preserved some 7,000 people who were faithful. Elijah was not alone. Neither are we alone nor will we be wiped out! So, where do we go from here? Those of us who are faithful need to be praying for those who lead government in our country and all over the world, that God will provide wisdom as they carry out their duties. God has said that He has established the authorities. Also that He would preserve a people faithful to Him. Since the beginning of the story of mankind, there have been nations bent on evil and destroying what God has made. Yet, through it all, God has preserved a people who are faithful. Some would say that until recently, the U.S.A. was that city on a hill that was a beacon and whose laws represented biblical values. I think it is safe to say that those days are quickly fading into history as our courts banish the name of God from public mention. Still, as the mores of our country sliding away from biblical values, His church remains as the bearer of eternal hope in our communities and true believers shine light in their arenas of influence and within our society. Some will be those who have huge audiences and some will be those who touch one life at a time. Let’s not cower in a dark corner. Let’s have our lights shine and let our prayers impact our world as never before. May your prayers be among those that are powerful and effective. Peace on earth, good will toward men! Acts chapter 2 tells us of the days following Pentecost, the days when the apostles, filled with the Holy Spirit, were teaching all who were within hearing range. Those who believed were filled with joy and joined in the fellowship of believers sharing what each one had. Verse 47 reports that they were praising God and having favor with all the people. This favor paved the way to tremendous growth in the number of people who were being saved. Exciting days those were, believers were being added to the body of Christ every day! Then the Jewish leaders saw that many were following “the way” because the apostles were teaching in Jesus the resurrection from the dead. The Sadducees did not believe in life after death. So they threw Peter and John in jail. Life begins to become complicated for the early Christians, not because of the Roman government, but because of the religious leaders. We have a saying these days that says, “We have found the enemy and they are us.” Isn’t that so often true? We feel constrained in following the word by our denominational preferences. Time passes and Paul, formerly Saul, begins to plant churches around the Western Asia world in places like Galatia, Ephesus, Colossae, Corinth, Athens, etc. The church at this point is growing through Paul’s teaching, yes, but also through the teaching of those who have learned from Paul. In 2 Timothy 2:2 Paul instructs Timothy as follows: “… what you have heard from me in the presence of many witnesses entrust to faithful men who will be able to teach others also.” This is how the churches where Timothy was ministering were to be (a) strengthened and (b) growing. Much of my life has been committed to mentoring and helping other men navigate life from a biblical perspective. A few years back, my son-in-law, Russell, gave me the 4-link chain shown in the picture above. I keep it on my key ring as a reminder of my purpose as I travel from meeting to meeting. Regardless of the subject of any meeting, it helps me keep an eternal perspective on the relationships interacting in those settings. How does it work? Paul said, “what you have heard from me …” are the first two links … Paul (the first link) passing truth and the message on to Timothy (the second link). Timothy, then was to entrust those truths to faithful men (the third link) who, in turn, would be able to teach others also (the fourth link). With each sharing of the truths of the Gospel, a new chain is started. We are called to share the truth of Jesus Christ, His love and His death and resurrection and the resulting future hope with others. Recently, I’ve been blessed to observe a couple of men prepare to share their faith with others, including their children! We are all trusting God to prepare the hearts of these “others” that God has laid on the hearts of these men. Yes, some of our words will fall on rocky soil, but some will fall on rich soil eager to hear the good news of the Gospel. A dear friend excitedly talked of “paying it forward” with another couple we both know. While scripture doesn’t have that specific terminology, the concept of sharing the good news of Jesus that we have received in a “pay it forward” manner certainly is biblical. We who have been gobsmacked by God’s grace, can’t wait to share with others who need to hear the freedom that comes from life in Jesus Christ. My challenge to you is to be the first link in the chain. Take the scriptural truths that you have received and share them with a friend or neighbor or even someone you know at church. Be in prayer asking God to guide you to that person who needs to hear His good news (gospel). We live in a world that is fearful and doesn’t know where to turn. They know they are looking for answers, and that there has to be a better way. Even though the media ridicules God and faith, when you build relationships with people to the point where you can hear their hearts, and they can hear yours, God will open doors. We’ll talk about this in another blog, but we’re not talking here about a Billy Graham style campaign on another person. We’re talking about building a very personal trusting relationship which gives each person the opportunity to hear heart level desires. Praying for each one of you, because you have a story to tell, a story of redemption and hope that another person needs to hear. 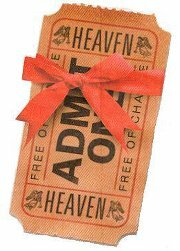 In the previous blog we talked about what it takes to go to heaven. The short version is that we need to believe in Jesus Christ. But what qualifies as a saving belief? James, the brother of Christ, wrote in James 2:19, “You believe that there is one God. Good! Even the demons believe that – and shudder! But we know that the demons do not have a saving faith. What then is the belief that brings us salvation that give us eternal life? Turning to the scriptures for clarification is most always helpful. I Peter 1:21 tells us that “Through him [Christ] you believe in God, who raised him from the dead and glorified him, and so your faith and hope are in God.” An element of faith enters into the equation here. The demons believe but they refuse to put their faith and hope in God. This begins to paint a deeper picture of the word ‘believe’ for us. I can believe that it is warm outside because the local meteorologist says it is warm, but until I step outside without a jacket, my belief is an academic thought. Not only that but the weatherman’s definition of warm may not agree with my sense of heat and cold. Not until I go out to experience it for myself, do I learn to have a level of confidence (faith) in that person’s perception of hot and cold. In the same way, we can believe there is a God. Then someone comes along and tells us that there is no God and that this world and life itself came about from a huge explosion and we evolved to the state in which we now exist. I am always fascinated by the number of people who ‘believe’ those theories, because to my way of thinking, such a belief system requires a greater leap of faith than to believe that our universe was created by the grand plan of God. But, I digress. Hebrews 11:22 says that without faith it is impossible to please God, because anyone who comes to him must believe that he exists and that he rewards those who earnestly seek him. Here, again, we see that our belief is a confident faith that God (which includes Christ) is who he says he is and that he responds favorably to those who search him out. It is interesting that as I watched the Macy’s Thanksgiving Day Parade, I noticed that the theme for this year’s parade is “Believe.” I am left to wonder what it is they want us to believe. Romans 3 provides additional insight into this believing when it says beginning in verse 22, “This righteousness from God comes through faith in Jesus Christ to all who believe. There is no difference, for all have sinned and fall short of the glory of God, and are justified freely by his grace through the redemption that came by Christ Jesus.” Here we have a faith (belief) in Jesus Christ that brings a righteousness that comes from God through his grace or undeserved favor.The Greek word being translated here is pistueo which comes from the Greek word pistis which is translated faith. The breadth of the word pistueo includes: commit unto, commit to (one’s) trust, and be put in trust with. It should also be noted that the word pistueo is a verb, an action word as the other possible meanings imply. The English words for pistueo align very closely then from the origin of believe which is pistis or faith. To put one’s faith and confidence into a person or object requires more than just acknowledging that the person or object exist. To acknowledge that a bridge exists and observe it is very different from beginning to walk across or drive across that bridge. By taking those steps you have put your faith in the fact that the bridge will sustain you. In the same way, believing in Christ and putting your faith in Christ require similar steps of putting the confidence of our salvation in Christ’s ability to redeem us from our sinful condition. As a result, very often we’ll use the words believe and faith interchangeably. Belief that Christ is the Son of God emanates from our confidence (faith) that He is who both He and the Father say He is, and that faith / believing in Him is our only path to salvation. So when the Bible says that whoever believes in Jesus will have eternal life, it is talking about that confident faith and belief. A friend of mine, Russ Crosson, introduced me to the term ‘truth system.’ That is part of our belief and faith in Christ, because that belief becomes part of our truth system or world view. One last word before I let you go on this point. At the point when we take on faith in Christ, it is not natural or normal that we will be theologically correct in every aspect of the faith. That is why Paul prayed for the church at Collosae so that they would be filled with the knowledge of His will in all spiritual wisdom and understanding, so as to walk in a manner worthy of the Lord, fully pleasing to Him, bearing fruit in every good work and increasing in the knowledge of God. (italics mine) The writer of Hebrews challenged the Jewish believers to grow by saying, “For though by this time you ought to be teachers, you need someone to teach you again the basic principles of the oracles of God. You need milk, not solid food.” So as with our relationships with people where we learn to know them, the journey with God is also that of getting to know Him and building our faith by growing our knowledge and familiarity of our Lord. I trust this has been helpful in clarifying what God desires in our faith and in our believing in Jesus Christ His Son. Over the course of the past six weeks Judy and I have been hosting a Life Group in our home. We’ve been following a series being led from our church entitled “Finding Your Way Back to God.” The series has been intended to help us focus from any starting point on our pursuit of and relationship with God. The biblical context for the series is the story of the prodigal son as found in Luke 15. For most people, finding our way back to God is not a six week study or exercise. Even the stories shared in the accompanying videos talked about a lifetime of searching for something more. We have a tendency to get stuck in our day-to-day lives, but we were made for so much more. God tells us that “I know the plans that I have for you ..” (Jer 29:11). These plans have been in place before the foundations of the earth were laid. Psalm 139 tells us that God knit us together in our mother’s womb, and that this work was being done with the knowledge of each of our days. So even before we were being formed, He was making plans for us. God had written in His book every one of our days that were made for us. Is it any wonder then, that we have this longing for more? He formed us with intentionality to meet the needs of the days that were made for us! Ephesians 2:10 tells us that we are His workmanship, created in Christ Jesus for good works, which God prepared in advance for us to do! It boggles the mind that God created Adam and Eve knowing full well that they would fall into sin. It certainly was no surprise to Him and He did not have to scramble to come up with plan B. God loved us so much that He gave us a free will that would be free to sin and free to love Him. He sent His one and only son to die for our sins and failings, so that by faith in Christ we could be restored into relationship with Him. With those same global concepts and thoughts, He created each one of us, intentionally, with a purpose, knowing that He would need to draw all men to Himself so that they could make the choice to open the door to their hearts and let Him come in. We all take different paths. I have been blessed recently to observe and encourage a couple of friends in renewing their walk of faith in Christ. Each came by a different path, but both, clearly came in response to the beckoning of the still small voice, that gentle knock on the door of their hearts and the engagement of plain folks like Judy and me. Along this journey, I have had a very real sense of fulfillment of the purpose for which I was made. That purpose began before I was being physically knit together in my mother’s womb. Much more to talk about regarding such journeys. For now, I ask of my reader, where are you in your relationship with God? I am reminded of an old family friend whom I hadn’t seen since childhood, but a man who had been friends of my parents’ for all of my lifetime. Our paths crossed, ever so briefly, in the lobby of a multi-organizational meeting. Almost without taking a breath after our introduction and greeting, he looked me squarely in the eyes and said to me, “So, Bill, tell me how things are going with you and God.” I confess that I was a little taken aback, but at the same time I felt as though I had just been touched by God Himself. I gave our friend a response that I’m sure in retrospect might have seemed a little shallow, but I promise you that I have never forgotten that very brief interaction. That story, too, is part of my journey and part of my story. Do you think you are pushing things too far with Jesus? That is the only way to know how far you can go. Great thought expressed here. How vast is our God? How limitless are His resources. You have not because you ask not. Thanks to my friend Michael Wilson for pushing my thinking today. God challenges us to get radical for his blessed son Jesus, the Messiah. This is not a life for the faint of heart. Jesus has won the victory and challenges us to live that life as well. We need more passion not less. We need to be more radical not softer. We need to pray to be more bold. Today is the 14th anniversary of the comandeering of four commercial aircraft. Three of them crashed into (1) World Trade North Tower, (2) The Pentagon, and (3) World Trade South Tower. The fourth hijacked over Pennsylvania, presumably to head for the White House. That hijacking was subverted by some very brave people and the plane crashed in a field in Somerset County, Pennsylvania killing all aboard. Thousands of lives were lost that day as the World Trade Towers crumbled from the heat of the fires created by the planes flying into them. It was a horrific scene. I remember that I had just concluded a meeting at Starbucks near our home and had returned home, clueless to what was going on. As I turned on the television in our family room, I was watching a reporter talk about the plane that had crashed into the North Tower. The North Tower was engulfed in flames in an area quite near the top. As he talked, I noticed a plane flying across the skyline and thought little of it until the South Tower exploded before our eyes on live TV. As the horrors of the scene continued to unfold, we learned that a commercial airliner had crashed into the Pentagon. The pieces then began to fall into place that our country was under attack. We later learned of the fourth plane that crashed in Pennsylvania. We had no idea how these events would change our world. During the ceremonies of remembrance today, one person being interviewed commented that unlike Pearl Harbor which was attacked by Japan, there was no country or political entity that had created this event. What we were dealing with was a fanatical Islamic religious group that worked out of Pakistan, Afghanistan, and some of the middle eastern countries. We found ourselves at war with an ideology rather than a country that could be punished or counter-attacked for such an attack. This was a new world and we knew little about how to combat an ideology. To this day we know little about maintaining a safe world, given the challenges of identifying the enemy. So where does this leave us? Our God is a sovereign God. Nothing happens in this world that surprises Him. Could He have stopped the attacks? Yes, but throughout history, He has chosen to give man a free will. And guess what? Despite many who want to believe that man is inherently good, the Bible tells us that we are ALL sinners (Rom 3:23) and that through Adam (one man) sin entered into this world. From the time Eve believed the serpent and gave Adam some of the apple, sin has been a part of who we are. Even Adam’s son, Cain, killed his brother Abel. From those tragic beginnings, the Bible tells us that everyone has sinned and the devil has been allowed to “prowl around like a roaring lion, seeking someone to devour.” (1 Peter 5:8) We are in a season where the devil who is called “the prince of the power of the air, the spirit that is now at work in the sons of disobedience,” is being allowed to roam this earth. As long as he is allowed to roam free, we will have a battle on our hands. Ephesians 6:12 says, “For we do not wrestle against flesh and blood, but against the rulers and authorities, against the cosmic powers over this present darkness, against the spiritual forces of evil in the heavenly places.” So there is a spiritual battle going on for which we need to be prepared. The rest of Ephesians 6 describes for us the “whole armor of God” that helps us withstand the spiritual forces that will attack our hearts, minds and souls. Romans 5:6 tells us that “While we were still weak, at the right time, Christ died for the ungodly.” God has a plan and that plan is at work. He says that Jesus will not return until every nation has heard the gospel. While we are fast approaching that milestone, know this. God’s timing is perfect and He will come to claim those who believe in the name of Jesus. I said above that God is a sovereign God which means that He is in control. The Bible tells us that He even puts the political powers in place. Romans 13:1 says, “For there is no authority except from God, and those that exist have been instituted by God. Therefore whoever resists the authorities resists what God has appointed, and those who resist will incur judgement.” An appropriate warning for our day, when Christians are so prone to protest and not comply with the law. It is important to remember during the days of Christ, the Roman government was as corrupt and debased as any in the history of man. In that light it is interesting that scripture does not record Christ railing against the government. He repeatedly chastised the church leaders, but never spoke about those in government. In fact, even after he had been anointed as the next king of Israel, when David had opportunity to kill Saul, he refused to kill the man who was out to kill him, because he was the Lord’s anointed. Another man’s wrong does not justify wrongdoing on our part. How then should we live? In the U.S., our government has long approved and funded abortions, more recently it has approved the marriage of gay and lesbian couples. We see many in the Christian community at a point of rebellion against our government, to the point that our speech has become hateful and unloving toward sinners just like us. God calls us to love Him with all our heart, and soul, and strength, and to love our neighbors as ourselves. If we focused more on loving our neighbors and less on hating the government that was put in place by God, perhaps we’d have a more attractive faith. Perhaps we’d be viewed not in the same light as the radicals Islamic terrorists. I’m not suggesting that we condone sin. Christ never did that, but still He loved the sinner. He told the woman who was about to be stoned for adultery to go and sin no more. A man asked Jesus what he must do to inherit eternal life. Jesus gave him the list of several of the commandments, to which the man replied, “All these I have done.” The next words are stunning … instead of berating and correcting him, the book of Mark records that “Jesus, looking at him, loved him …” and told him to go sell everything he owned and give the proceeds to the poor. I fear that in today’s Christian community we would be prone to show our skepticism and dismiss the person out of hand by saying something to the effect, “Yeah, right!” Our challenge is to be Christlike. Be a Berean by studying the scriptures so that you know how to respond. Christ told us to love those who hate us and to love our enemies. That is not a model I’m seeing widely practiced in the public arena today by “Christian” politicians or even those who are posting on the social media. We are throwing the Bible at these sinners and expecting them to live up to our standards without the help of the Holy Spirit! Let’s think about our rhetoric and vitriol before denouncing unbelievers and trying to hold them to biblical standards. 1 Corinthians 5:9-13 tells us that it is not our job to judge those outside the church. That is God’s job! Our job is to love those outside, so that they will come into the church. The Holy Spirit then convicts men of sin. Just suppose that we loved our enemies and those who hate us. Might there be fewer, then, who hate us? We’re doing a fantastic job of making new enemies with each self-righteous statement that we make.